Azure Stack is a recent offering from Microsoft that aims to recreate IaaS and PaaS capabilities in the public cloud (pools of compute, storage, and networking that can be easily consumed by developers and applications) in your own data center. One goal of Azure Stack is to enable the fabled hybrid cloud, in which developers can use the same tools and processes to write applications and run workloads either on premises or in the Azure public cloud. As today’s guest puts it, Azure Stack is meant to be an extension of Azure. 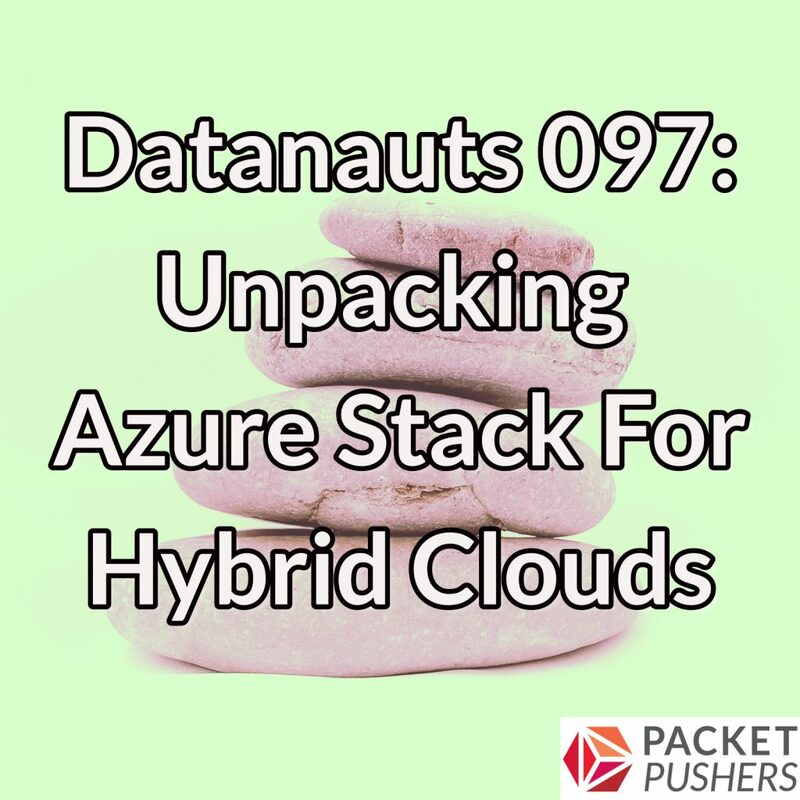 Today on the Datanauts, we unpack Azure Stack to get a closer look at its primary components, explore the rationale for adopting Azure Stack, look at integrated systems that support it (and are required to run Azure Stack), and point listeners to resources to let them play around with the technology. Our guest is Ned Bellavance, Director, Cloud Solutions at Anexinet, a VAR and systems integrator. You can follow him on Twitter or check out his blog at nedinthecloud.com. Ned also podcasts at Anexinet Insights. -disaster recovery / business continuity. How do you, or even can you, replicate data to another site, sync or async? Without this the solution is pretty worthless for enterprise. -how will updates be handled? Push? Pull? Disruptive? Also somewhat important for enterprise. -how will an application transaction be handled for all the CRUD cases be handled when part of the end-to-end flow is in legacy and part is in Azure Stack? Presumably not every app will be totally net new and disjoint from the rest of the business. -how does Azure Stack networking integrate with the in-place network? Just a rando comment that I see the Azure/AzureStack-Tools GitHub repo has an MIT license with defined contributing guidelines. This is encouraging, but kinda comes to a screeching halt where the software meets rigidly defined hardware.